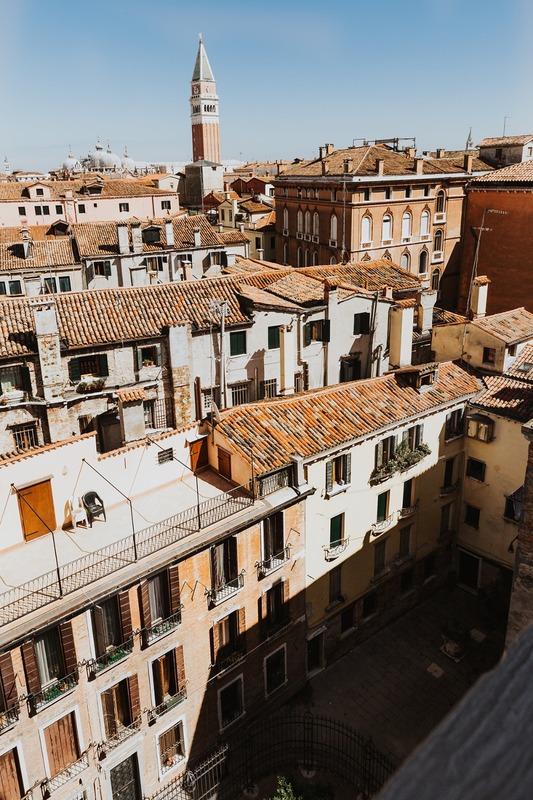 Calling all lovers of Italy! 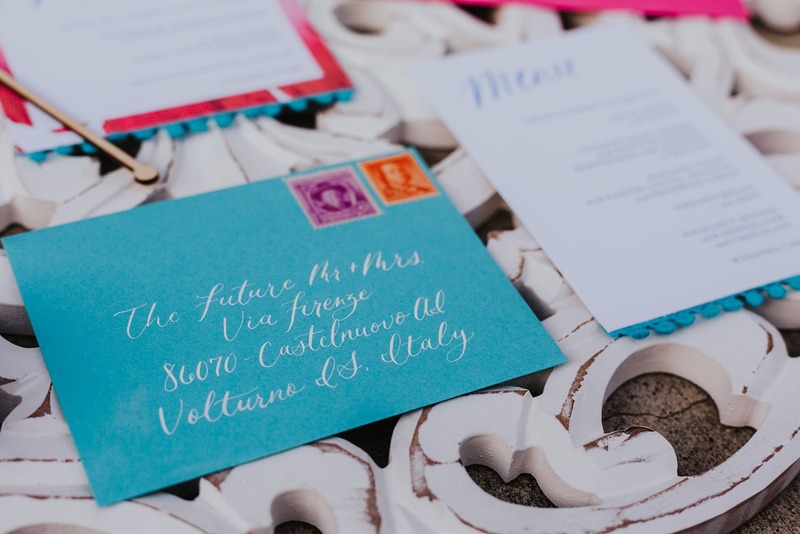 We have the perfect wedding ideas to share with you thanks to our partner Chrissy Gilmartin Photography. 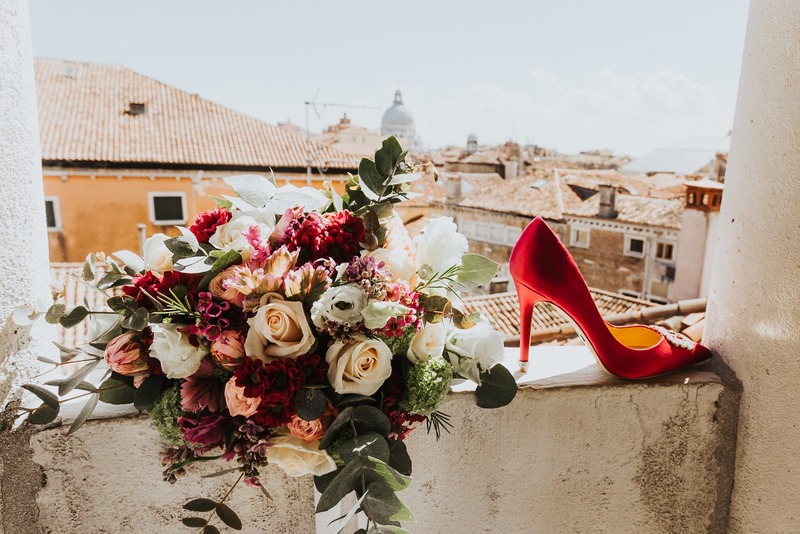 Starting off with a gorgeous getting ready view above the city of Venice, followed by a photo shoot following the sweetest wedding couple through the streets, and wrapping up in a stunning and intimate sweetheart table at the very top of the spiral staircase of Scala Contarini del Bovolo. Seriously, if you love Italian culture or are just a fan of old fashion romance, you need to keep scrolling. Oh, and don't forget, there is always more to be seen of this lovely day in the full gallery! Venezia... The city of love... No truer words could be uttered when it comes to what I experienced on my last journey to this STUNNING city! 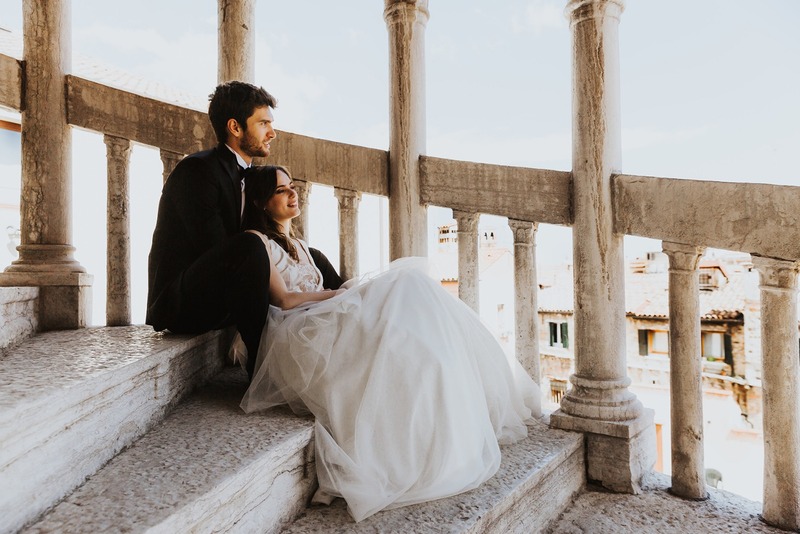 After traveling to Southern Italy several times over the last year for several weddings and photography conferences, I soon fell in love with everything Italian, and decided that I would completely focus on this one beautiful country for destination weddings! 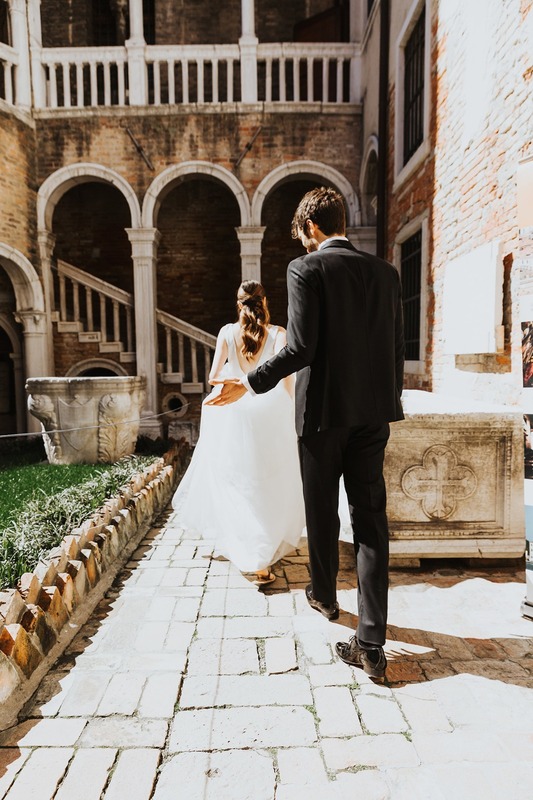 Fast forward a few months later, and many calls, emails, and video chats to various wedding coordinators, and it was done... 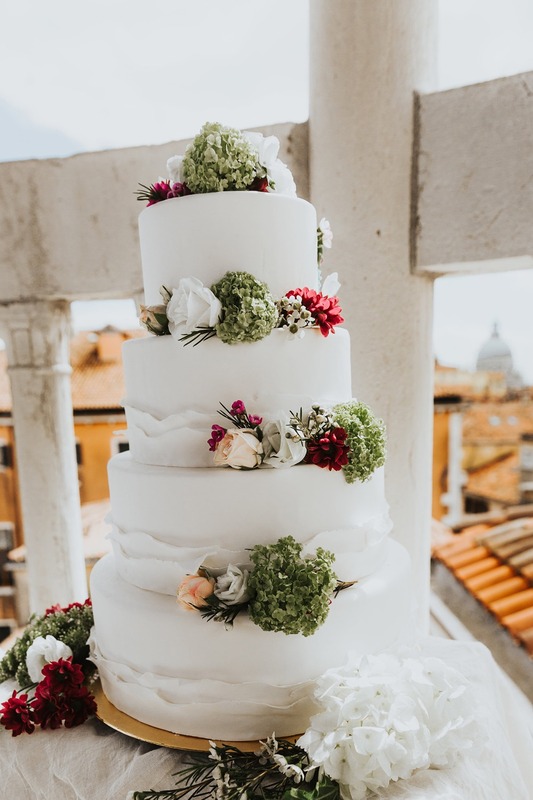 I booked my flight, along with plenty of business lunches to connect with Venetian wedding vendors! 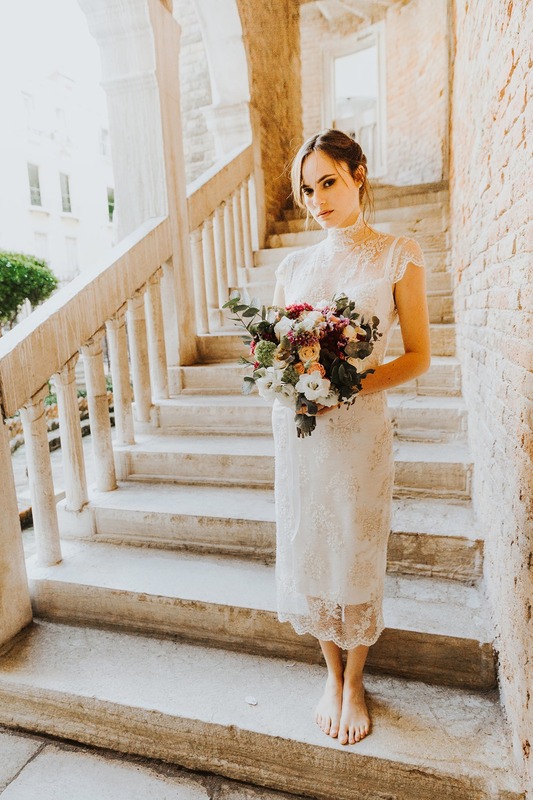 As I was preparing for my trip I realized that this would be the perfect opportunity to organize my own styled shoot while there, so that I had some images for my portfolio to aid in my new found love of Italian destination weddings! 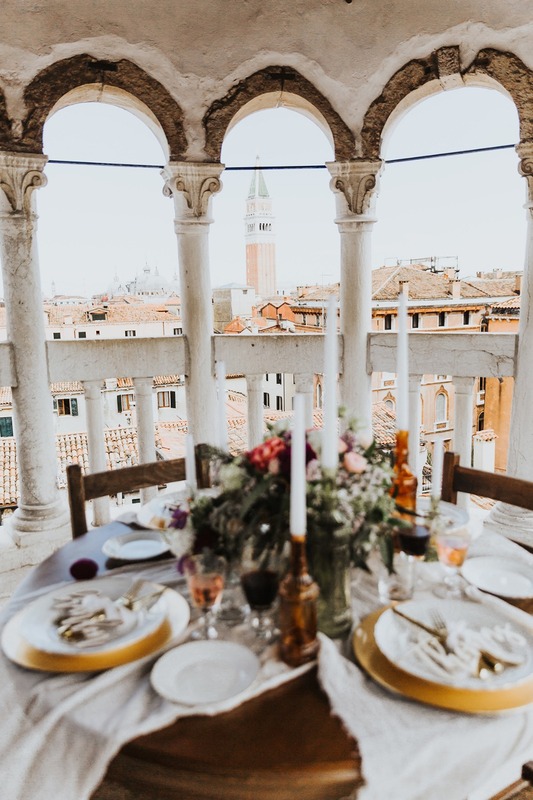 It was then that I connected with Amber Mollison of Angel Lion Weddings and Events, an American Wedding Coordinator living in Venice and specializing in gorgeous Venetian weddings! 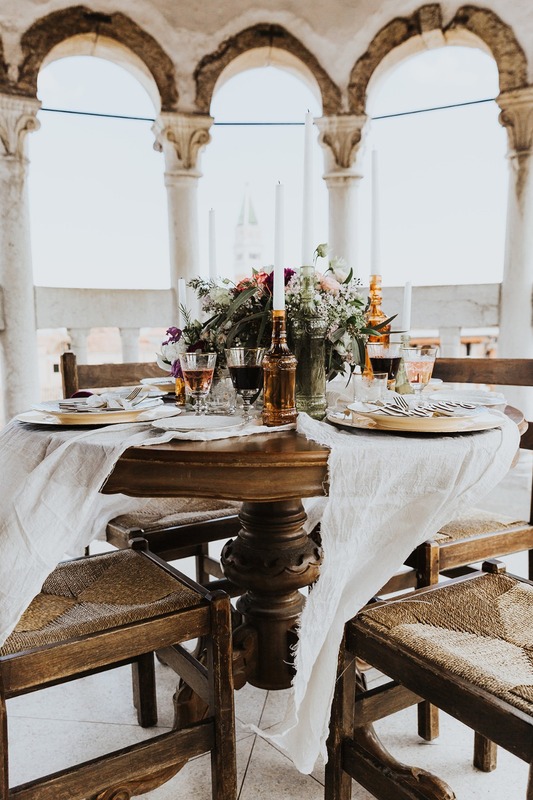 Amber and I quickly hit it off and began creating a vision for what we dreamed of when thinking of the perfect Italian destination wedding! 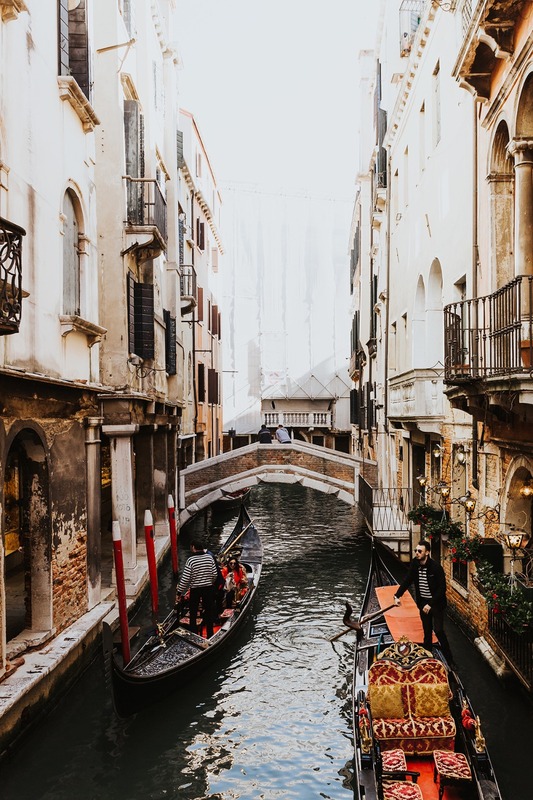 Amber had quite an impressive list of Venetian connections to work with due to her successful wedding planning business there, so she would be key to ensuring we had only the best vendors to choose from! From the heavenly florals created by the award-winning La Dogaressa flowers, to the extremely exclusive, and recently renovated Historic Scala Contarini del Bovolo she was able to secure for the shoot, to the super talented Paola Giancola who was magical in creating the perfect wedding day hair and makeup, and then booking the amazing, real-life couple to model for us! 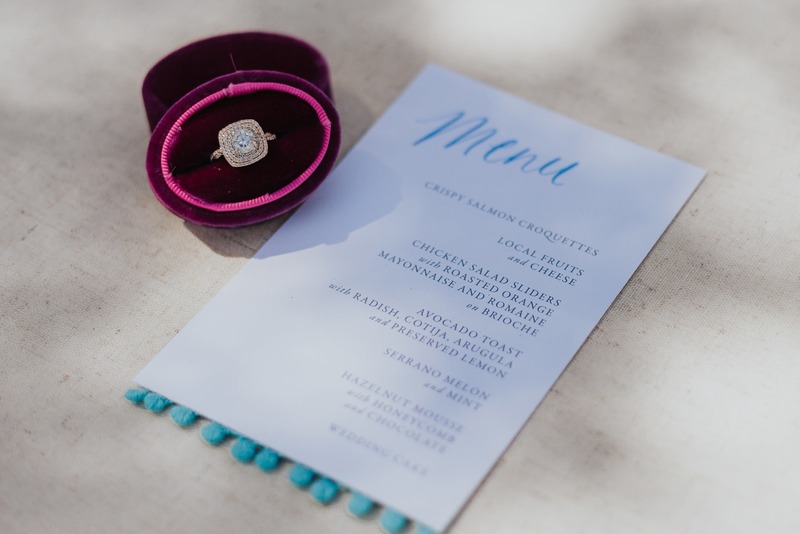 Every last detail was planned to perfection! This is where I really lucked out! Kate Edmondson of Edmondson Bridal Couture from the UK reached out to me after seeing some of my work and let me know that she would enjoy working together on a future shoot, so when I told her that I was actually in the process of organizing one for Venice she was thrilled and said that I could choose any two dresses from her amazing collection, and she would happy to ship them to Italy. 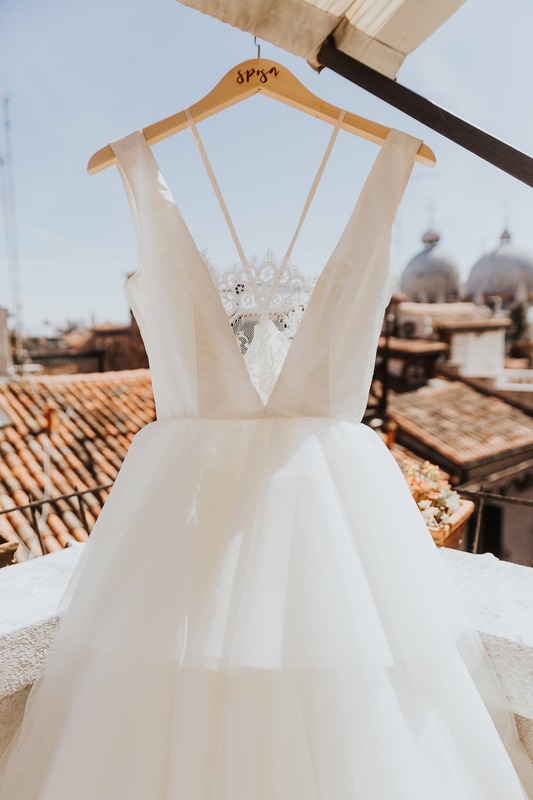 I swear, it was almost like a child on Christmas morning… The day they arrived at Amber’s chic apartment in Venice we could not wait to rip open the box, and when we did, the both of us could not believe how truly beautiful these two gowns were! I can’t lie… had those stunning gowns been in my size I might just have thrown them on and gone out for a night on the town! Top that off with a magnificent, handcrafted, raspberry toned ring box from the lovely Family Joolz, and we were all set and ready to go! 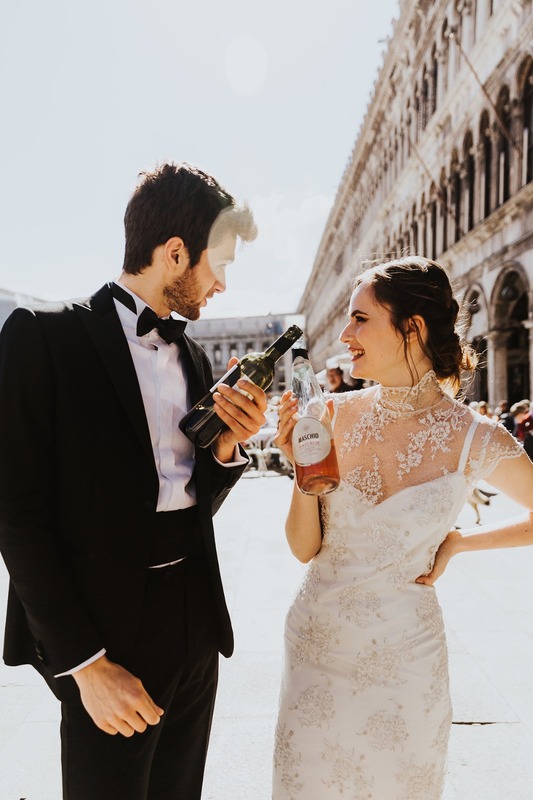 Alessandro and Francesca, the real-life couple who modeled for the shoot, showed up to my San Marco Square apartment I had rented for the week at about 9 am, followed by Paoloa – the HMU. 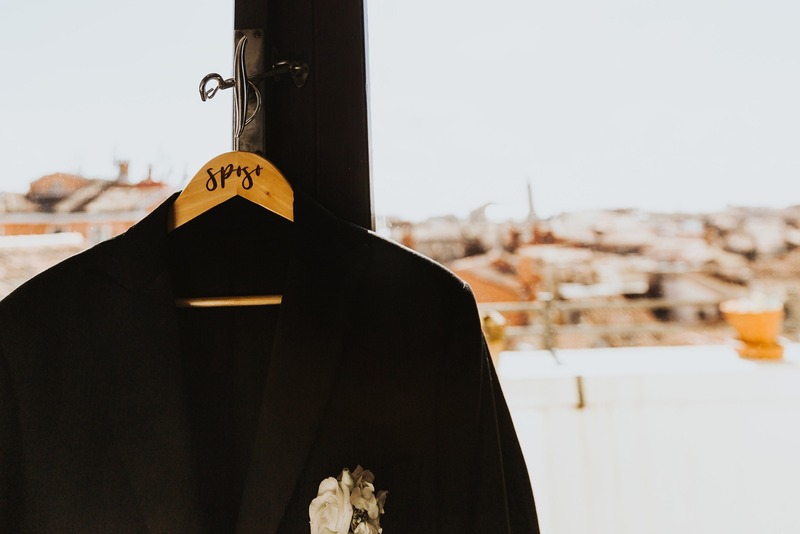 Soon thereafter Amber arrived with the dresses and the groom’s suit and Paola got started working on the stunning “bride to be for the day”! 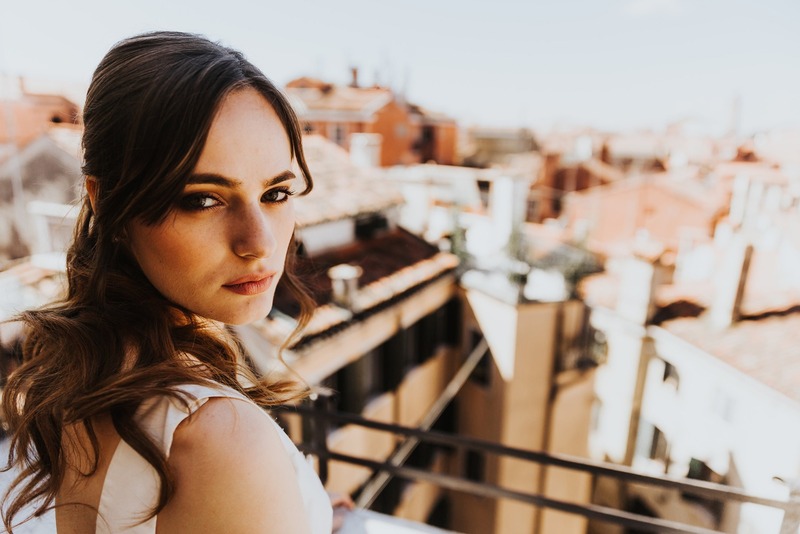 We chose to place Francesca in a chair near the window that overlooked the picturesque San Marco square, which provided the most beautiful light for Paola to work her magic! 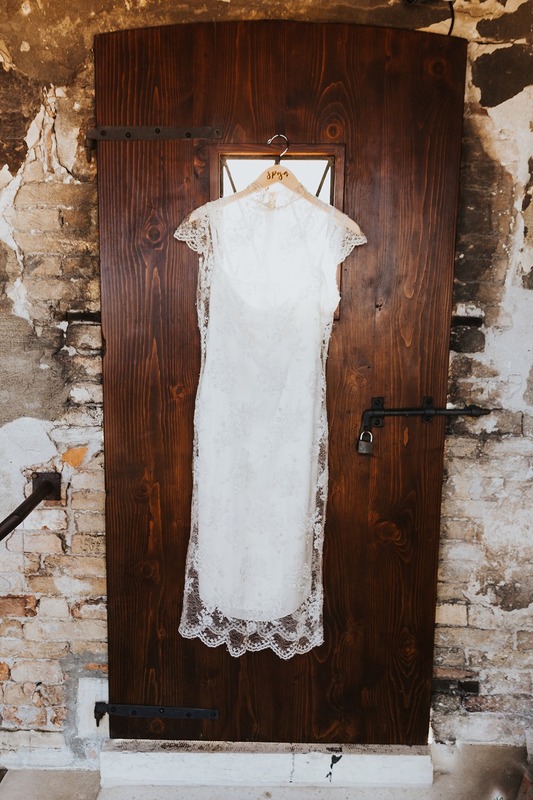 While the models were getting their last-minute touchups done, I scoured the apartment looking for the perfect place to hang the gown, and get that all important “money” shot to show the pure beauty of this amazing Anastasia gown we were so lucky to get! As I walked out onto the back patio I noticed the perfect spot overlooking the infamous domes in San Marco Square, and quickly checked the light to make sure it was ideal. 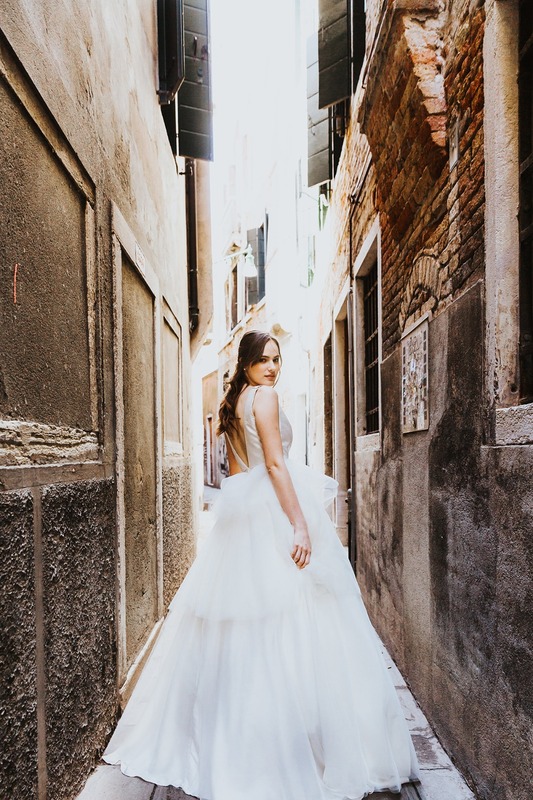 I then grabbed the dress to make sure that I was able to capture not only the stunning couture gown but also the striking backdrop of bellisima Venice! 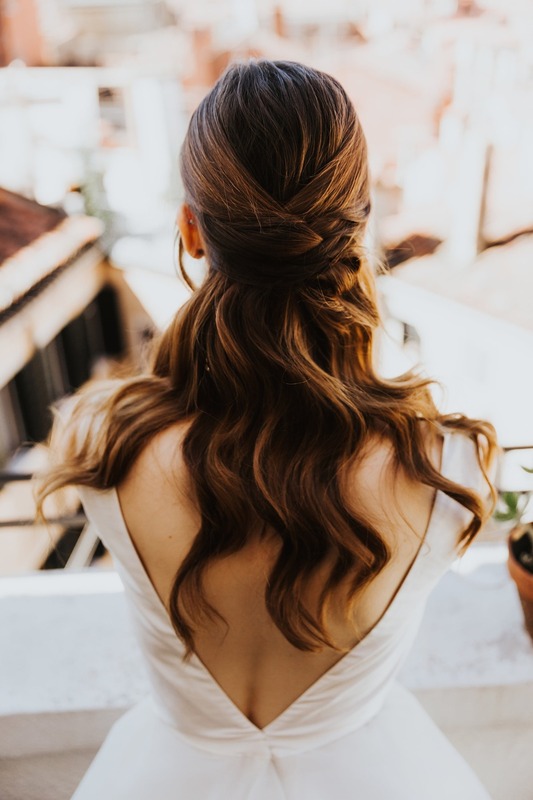 The models were ready, and Amber had headed over to the venue to meet with the caterer and the florist to start setting up, so now it was time to get these lovely humans down to the square and start snapping away! 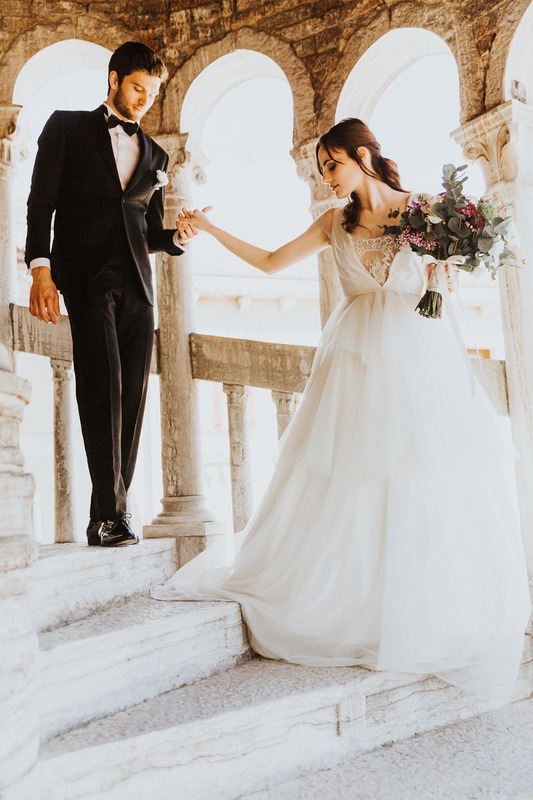 I truly cannot describe the feeling I had as I walked behind this handsome couple, dressed to the nines in couture wedding attire, and watched as hundreds of locals and tourists yelled out "Evviva gli sposi" and “Auguiri”! Basically wishing them good luck and congratulations! We even were stopped by a large group of Japanese tourists, and before you know it, there were selfie sticks out and tourists everywhere stopping to “snap” a selfie with the couple! It was something I will never forget! After weaving in and out of the spectacular and narrow alleyways of Venice for about 15 minutes, we finally arrived at the remarkable Scala Contarini del Bovolo! Now imagine for a moment being swept back in time, and you are standing in front of an architectural masterpiece that has been in existence for over five hundred years! Words really cannot describe what it’s like to see such a magnificent piece of architecture in person. 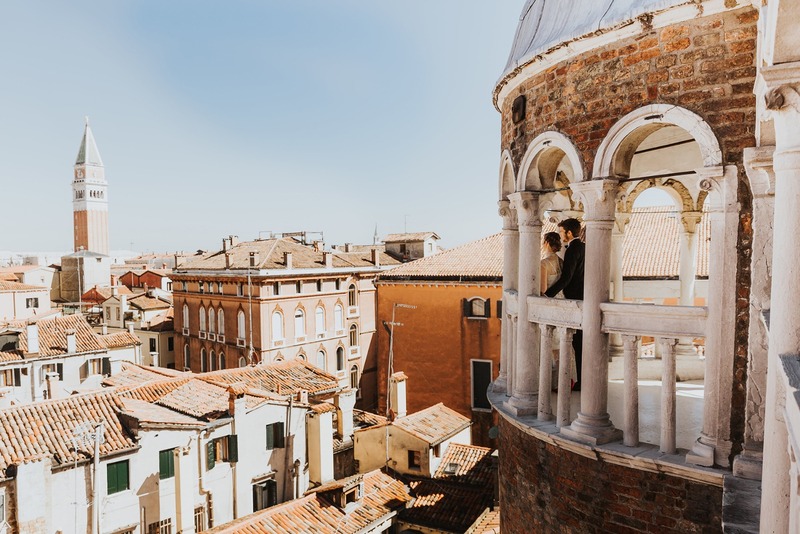 As referenced by its name, the historical building was once owned by the noble Contarini family throughout the eighteenth century, but then passed through several hands before settling into ownership by the city of Venice. To say that we were lucky to have private access to this dazzling estate would be quite the understatement! 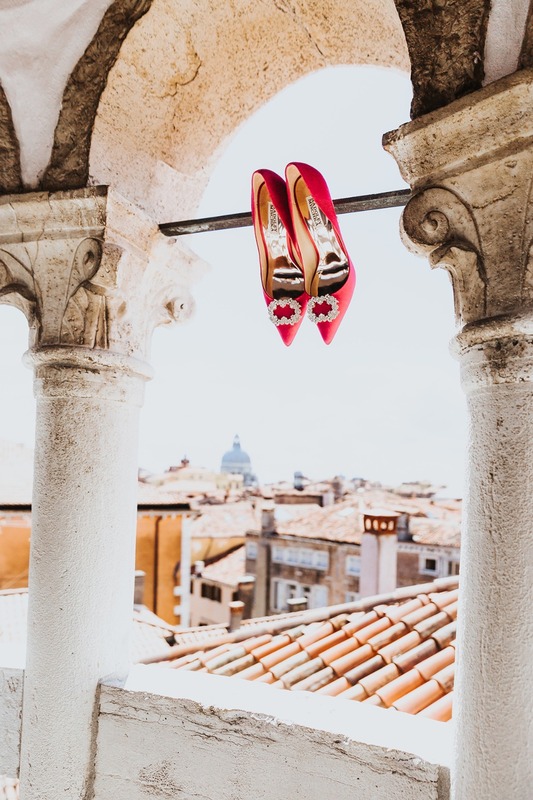 As we arrived I looked at Francesca’s face, as she gazed at the nearly eighty steps up the winding staircase that she would soon be climbing in some very elegant fuchsia Badgley Mischka’s, and I could see the fear already! I pulled her to the side and told her to take off her shoes! There was no way I was going to have this poor girl wearing herself out already hiking up that steep, six-story spiral case… She gave me the hugest smile and pulled them off and started heading up with Alessandro following close behind! When we all tiredly arrived at the very top I was taken back, nearly to tears albeit, by the sensational view before me… I have never seen such a beautiful view of a city in my life. It was breathtaking! 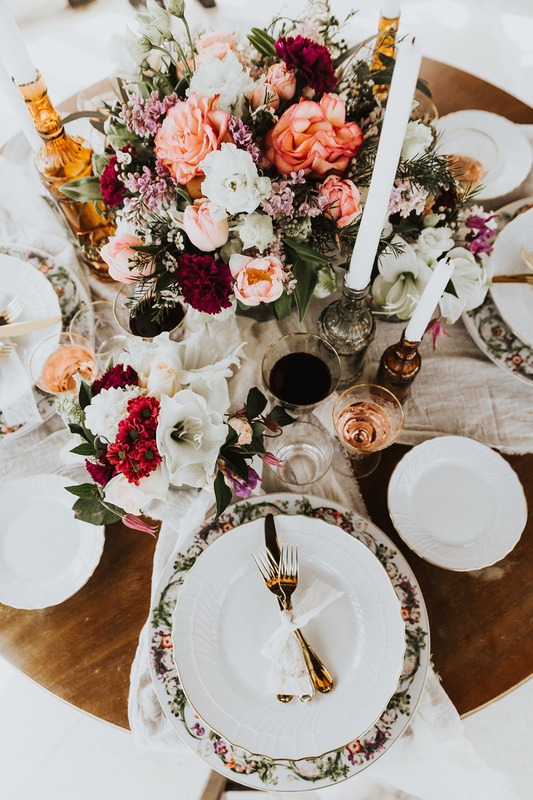 And as if it could get any better, I was then taken even further back by the pure elegance and impeccable design of the tablescape laid out before me... 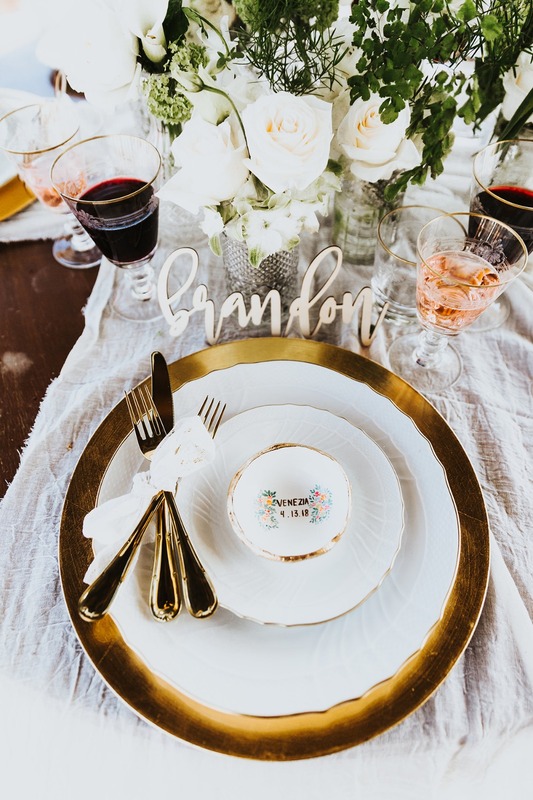 The florals, the china, the perfectly suited accessories, and details – it was all simply perfect! I wanted a few special "extra's" - to really personalize the day and make it unique. 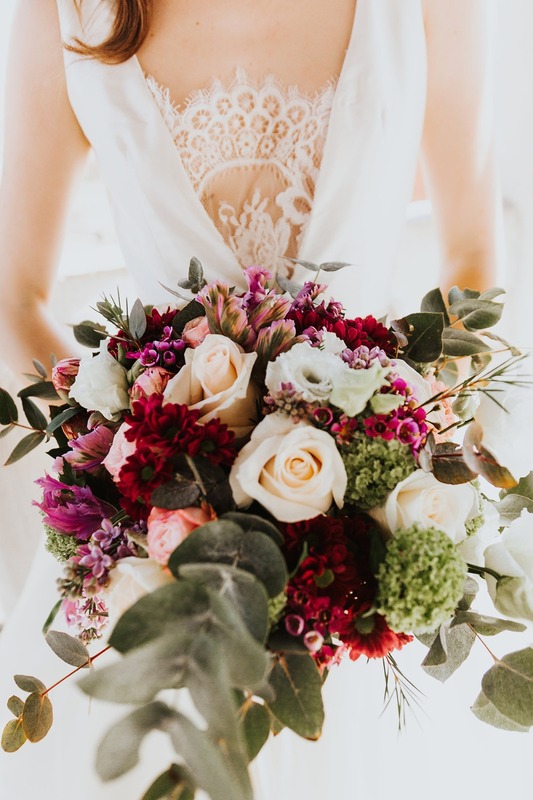 In comes Delovely Details, an off the page awesome company specializing in personalized bridal hangers, wooden signs, and anything else you can dream up!. 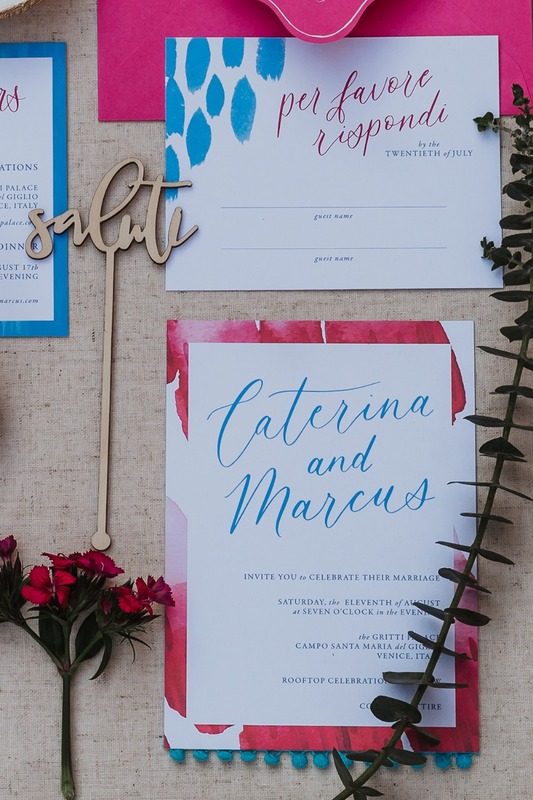 I reached out to Nicole and she immediately jumped on board and sent me the most amazing bride and groom custom wooden hangers engraved in Italian. 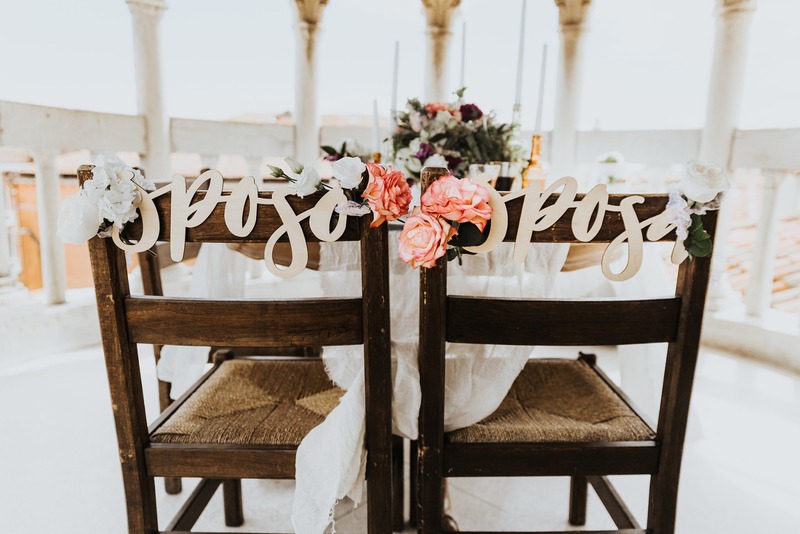 She also threw in the most beautiful Italian wood cut out signs to hang on the back of the chairs, as well as several smaller wooden custom names for the tablescape set up, and the cutest "Salute" drink stirrers! Needless to say, I was THRILLED! The first company that came to mind for the favors was The Painted Press. I had seen Natalie's work and was very familiar with her beautiful, handmade and custom dishes for quite a while, and was just praying that she would hop on board and want to collaborate as well! 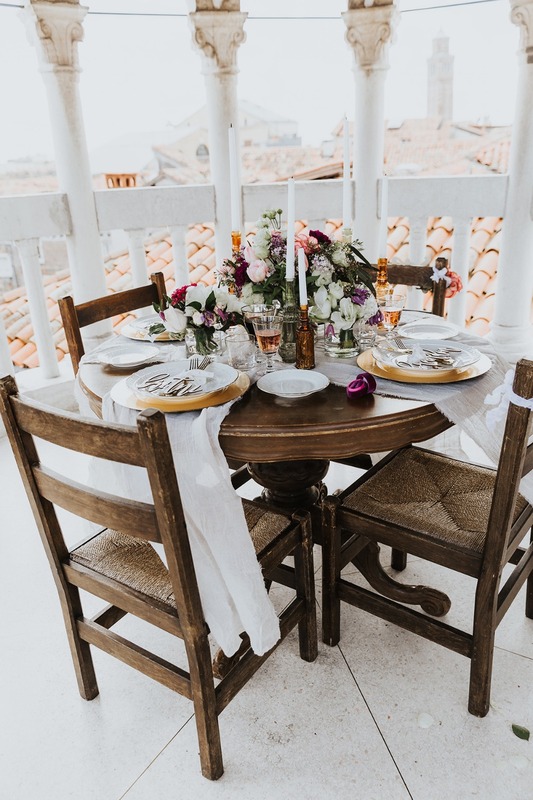 Thankfully as you will see, she was just as excited as I was about this inspirational shoot, and she agreed to make several handmade, and completely custom, gorgeous dishes that were all hand painted with the wedding date and the country “Venezia” on them! I can still remember the day these arrived at my doorstep and the sheer joy of opening them up and seeing how truly perfect they were! 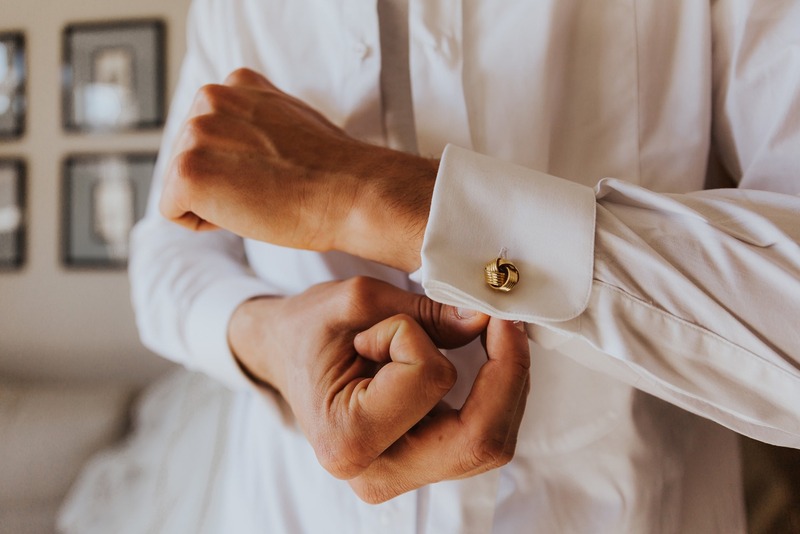 Now with me being in America, I chose to focus on collaborating with vendors that I had worked with here in the states and could provide me with fabulous products that I could bring along with me on the plane. 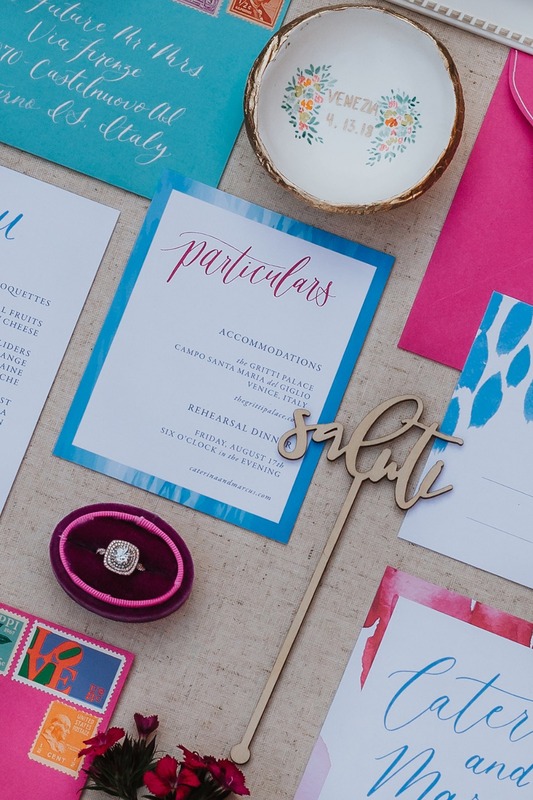 For the invitation suite and menus I was able to secure Holly, the owner and main creator for Sablewood Paper Co. I had worked with Holly on several shoots prior to this and was blown away by her stunning work, so I knew she would be the perfect fit to create a completely custom suite to coordinate with our vision! After shooting the couple up top, I decided to take them down the staircase again and stop on a few floors to catch a few different angles, before heading down to the ground floor. Now it was time for us to have Francesca change into the second amazing Kate Edmondson gown… the alluring Sophia gown! This was quite a different look than the more airy and young look of the Anastasia gown she had first donned! Paola assisted Francesca in getting dressed and doing a few touch-ups, and then we were ready to rock a few more shots closer to the ground floor and in the reception of the building. At this point, I felt like we had all the shots we needed and more, and it was time to relax and give these beautiful and tired humans a proper drink. So we grabbed the bottles of wine and Prosecco from the tables we used on the rooftop, and headed off back to the apartment! 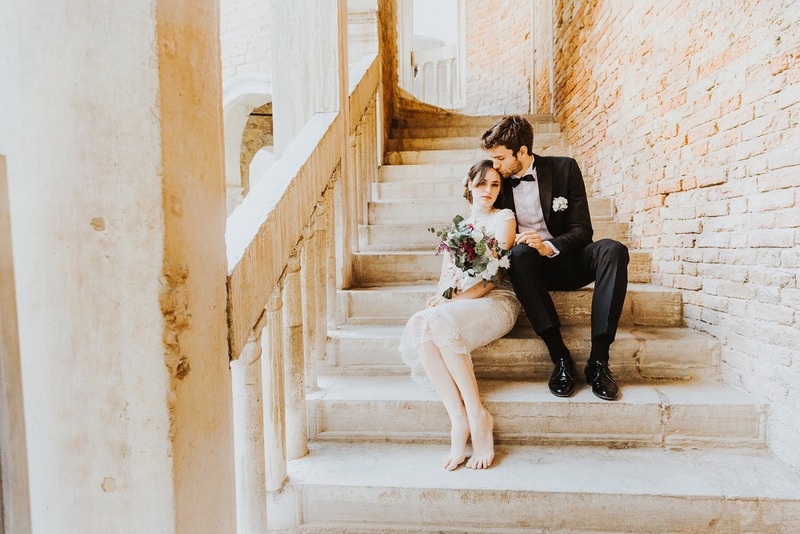 When we had just about arrived back at the apartment I had an idea… Most Italian wedding shoots that I have seen published tend to shoot towards a more romantic and formal vibe… And while I can fully appreciate this, that style of photography AND potential couple is really not my jam. I would definitely say I am more of a laid back, real, and fun photographer! 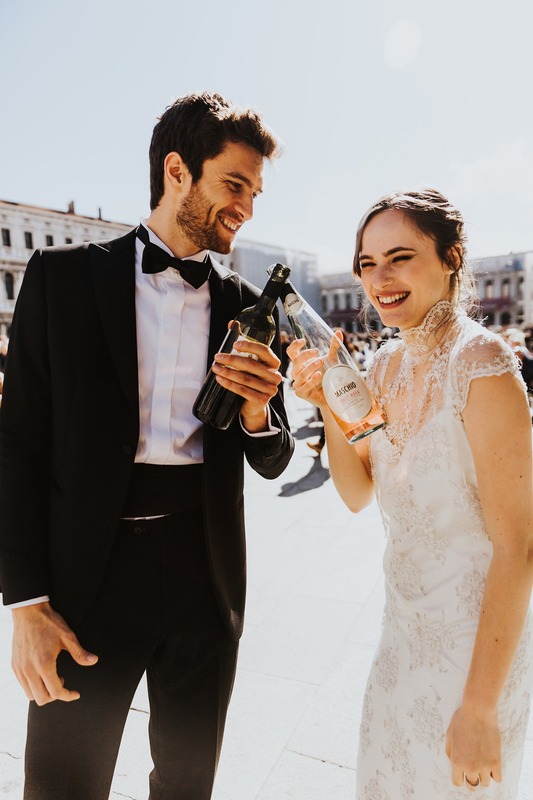 So after getting to know the playful, silly, and super in love Francesca and Alessandro throughout the day, I knew they might just be up for a few more “Fun” shots down in the square again! So we stopped right out in the middle of the square, shoes off, large uncorked bottles in hand, and I let them know they could take a swig! At first, I don’t think they understood me, as they gave me a look like I was an alien! 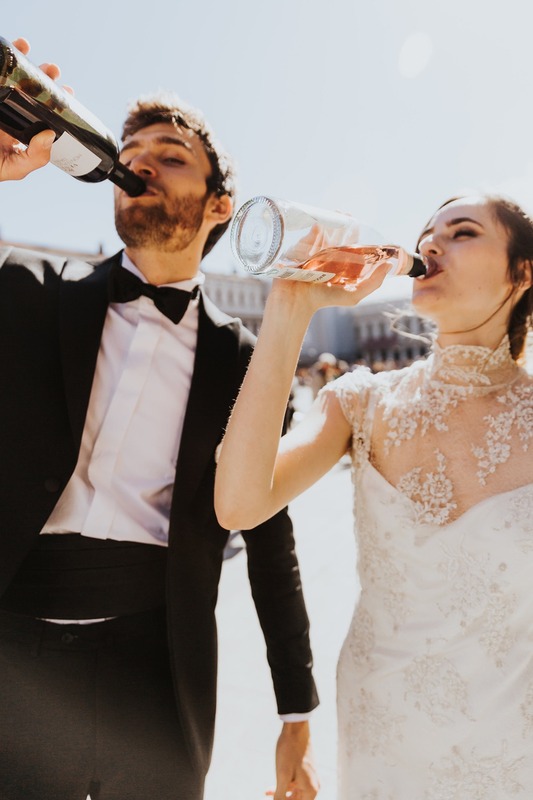 But I told them again, “ Ok, go ahead and take a swig – drink out of the bottle and cheers each other with your bottles!” And as the huge smile quickly came across their faces, it was done! Both bottles were in the air and they were toasting away! “Cin Cin” could be heard from all around us! It was freaking amazing… I literally could not have dreamed up a better or more perfect couple for me to shoot with! From sticking their tongues out to going shoeless to swigging full bottles of Prosecco in the middle of thousands of people, these two hilarious and internally beautiful humans were exactly what I was looking for. And it was a WRAP! A long 8 hour day of running through narrow alleyways being chased by tourists, up an insane six-story high ancient, historical building, back to one of the most famous squares in the world! This my friends was an experience which I will never forget and I will be forever grateful for… Dreams do come true… Just get out there and make it happen I say! !